Suspicion was one of the games that caught my eye while walking through the halls of GenCon 2016. My interest in the game stems from a number of reasons. First, the game was centrally located at a booth that had the Alea and Ravensburger logos proudly displayed on the back drop. Second, the art deco style illustration on the cover was very appealing. Finally, the sign next to the game which proclaimed “Now available at Target” made me look – there is definitely a great movement of hobby games to the mass market, and clearly Target is leading the pack in this. There are a number of games which are Target Exclusives, and that’s certainly a great motivator to go there and look for new games. After talking to the folks at the booth, it turns out that Wonder Forge is a company which used to make mostly kids games, generally with movie or TV tie-in licenses. However, they have recently signed a deal to help with the US distribution of Ravensburger and Alea games. They also had the US version of the Castles of Burgundy card game and Broom Service on display. In this game, players are one of ten people invited to a masquerade gala by Baron Whitetooth. To make things spicy, all of you players are gem thieves, and everyone will be walking around the mansion trying to take what they can while keeping their own identity secret. The mansion is a perfect rectangle shape, split up into 12 rooms. Each of the rooms has one or two gems pictured in the center of the room – out of three possible types. There are a few rooms which have only one gem, but the majority have two. The ten characters are randomly placed, one each in every exterior room of the mansion. 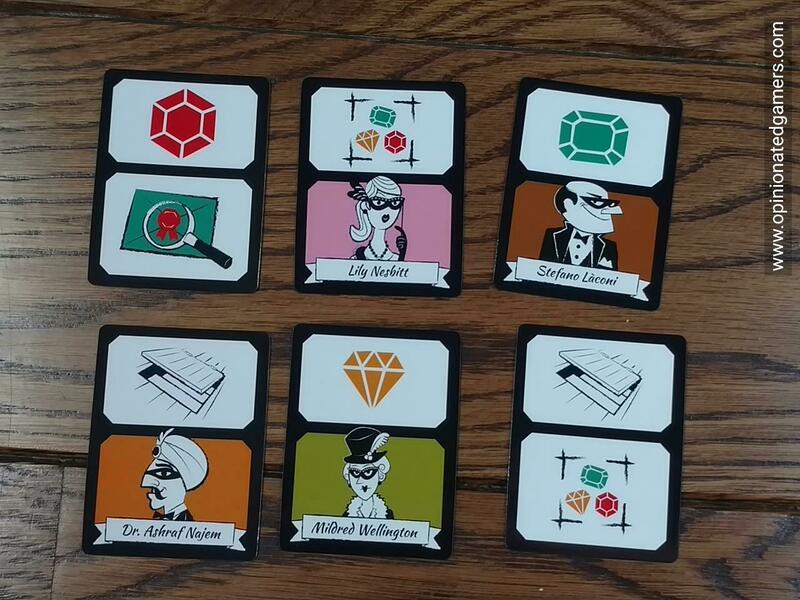 Each player is dealt an identity card from the character deck – they keep this secret! One of the goals in the game is to keep your identity secret from the other players. The unused cards are kept is a deck near the board. 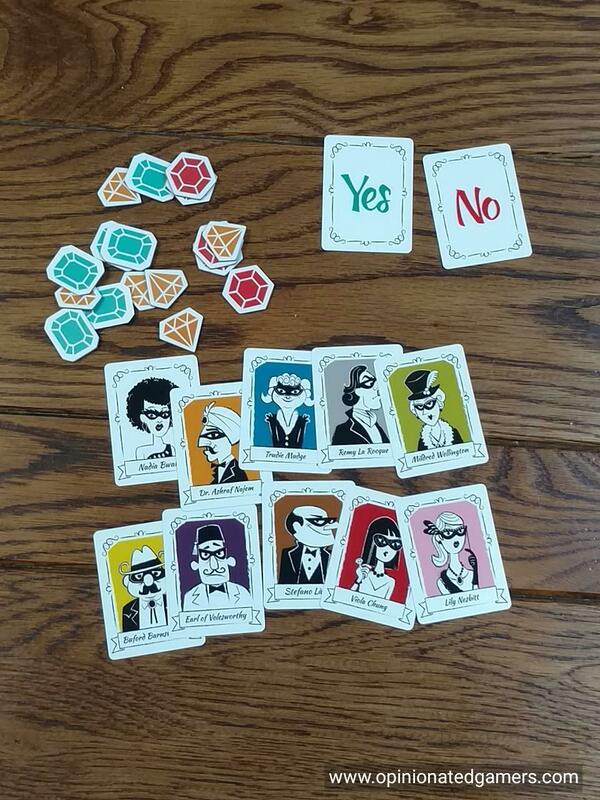 Each player also is given a set of grey “yes/no” cards which will be used in the interrogations. Finally, players are dealt two cards from the action card deck. 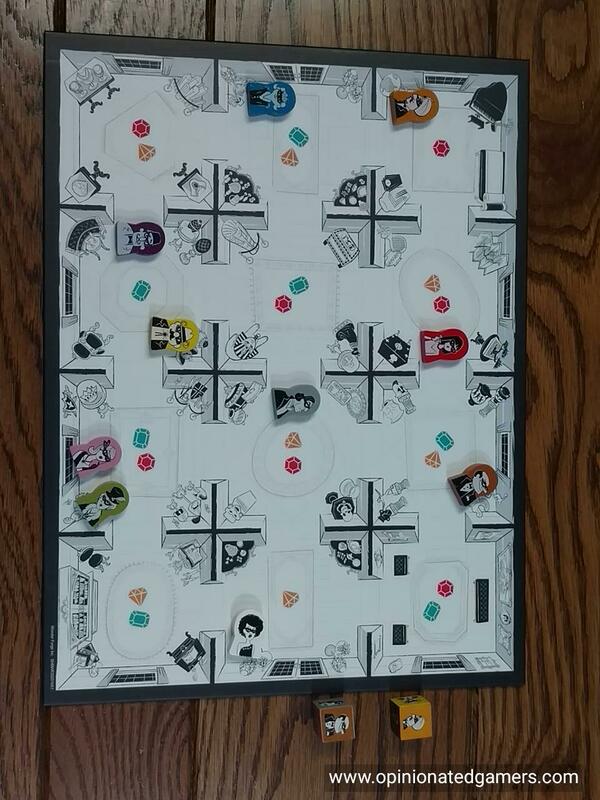 Finally, some gems of each color are set next to the board (the number is based on the number of players in the game), and each player is given a deduction sheet from the tear-off pad. Players take turns around the board until the endgame is triggered – that is when one of the three color gems is no longer available in the supply. The first thing the active player does is roll the two movement dice. Each of these dice has 5 different characters pictures and one wild side (which means you can move any of the 10 characters). Each of the designated characters is moved into an adjacent room from where they currently stand. There is no limit to how many players can be in a room. A single character may be moved twice in a turn. Room Robbery – you may take a gem from the supply. This gem color must be found in the room where your character’s mover currently resides. Give your opponents time to record information on their sheet. Peek at an invitation (identity card) – look at the top identity card of the unused invitation deck and then place it on the bottom of the deck. 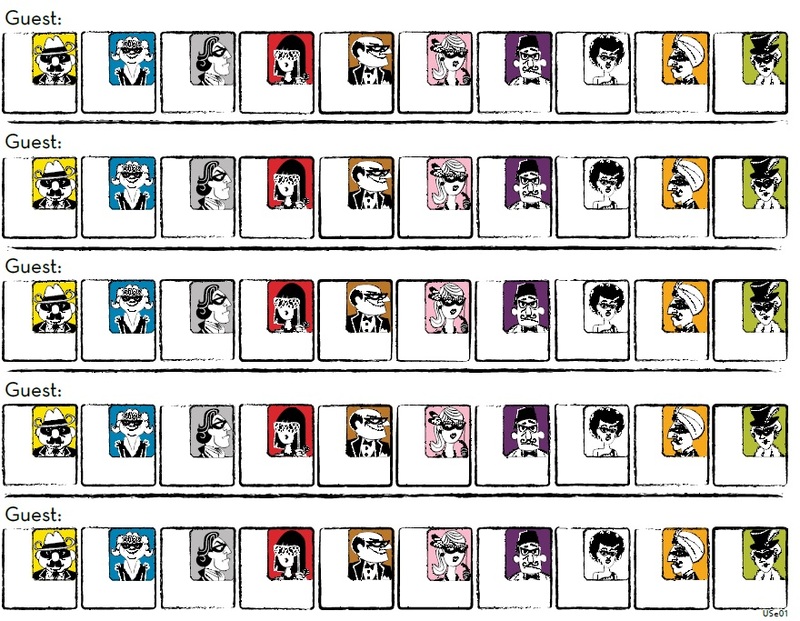 Question a guest – one of the ten characters is shown on the card. You then ask any of the other players in the game if their secret character can “see” the one shown on the card. That is, on the board, are they in the same row or column as the indicated character. Of course, if the player is the denoted character, he can always see himself. The player who was asked uses either his “yes” or “no” card to answer – so that only the person asking the question gains information from the question. Again, the game ends immediately when one of the three types of gems is exhausted from the supply. At this point, all players take a final look at their deduction sheet, and they must now make their best guess to the identity of each of the other players. You will score 7 points for each player whose identity you have correctly deduced. You then score your gems – you score 6 points for a full set of three different colored gems, and 1 point for each gem which is not in a full set. The player with the most points wins. If there is a tie, the player who was able to keep his identity secret from the most other players wins the game. For a game available at a mass-market store and meant for families – this one looks like it could be a big hit. The game is simple to teach and learn, and I’ve had good success introducing this to people who are novice gamers. The theme is a familiar one, and the concept of using deduction sheets will be familiar to many Americans from Clue. There is a surprising amount of strategy involved in trying to hide your own identity. The main way to get gems (in order to score VPs) is to pick them up via the Room Robbery action. Of course, each time you do this, you often allow your opponents to learn valuable information about who you aren’t – as they can eliminate all characters who aren’t standing in a room with the gem visible. It takes a bit of skill to manipulate the movers and keep your identity hidden. You could also focus on trying to determine the identities of each of your opponents. As you get 7 points for each successful deduction, this really becomes a big part of your score – generally, over half will come from this. If I had a complaint to the game, it would be that there is too much time allowed for the deduction in 2 and 3 player games. In my games thus far with low player counts, it is more the rule than the exception that all players have been able to figure out who the other players were. The rules do suggest that if you want a shorter game, you reduce the number of gems of each color to start the game – and when we tried this, the game became more interesting because you now really had to make a choice each turn between grabbing gems for guaranteed points versus working on deduction for the big payoff at the end. 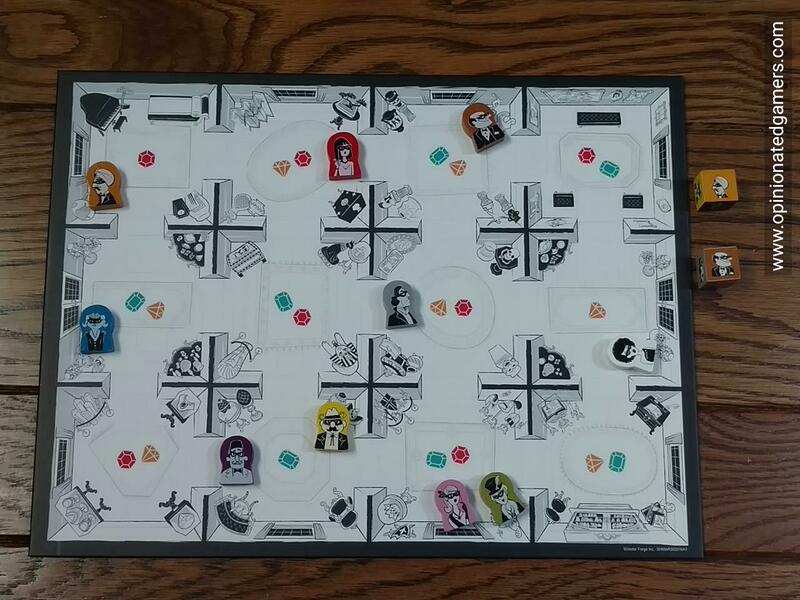 The game also seems to work better at the higher player counts – in a test 3-player game that we played, it was very easy to deduce identities mostly because you only had two other players to target your interrogations, and thus, you got plenty of info on both. In my one 6-player game, it was much harder as you had many more options when you got the chance to ask a question. Like any deduction game, the whole game pivots on the fact that all players are able to give correct and truthful answers when asked – so be sure that everyone understands the interrogation rules at the start of the game, and it might help to go over them for the first question or two – when you can use the actual position of the movers on the board to show who can and cannot see the targeted character. I personally like the very simple packaging/art style. The majority of the box is plain white or teal, and I find the line art illustrations to be very eye-catching. The game is an exclusive at Target, and at a price point of $19.99, it is a great entry point to games that are more than just roll-and-move. It’s obviously not a game that I’ll play regularly with my normal game group, but one that I will definitely keep around as an introductory or gateway game for guests. Eric Edens: For $20, this is a must buy. I really think if you have non-gamer friends who talk about liking Clue, this game is required play. I really think this game in its simplicity can bridge the gap for new players into the deduction genre that Clue stepped their toes into. I can wager that at Target Clue is the same price as this game and of course this game is the better buy for me. 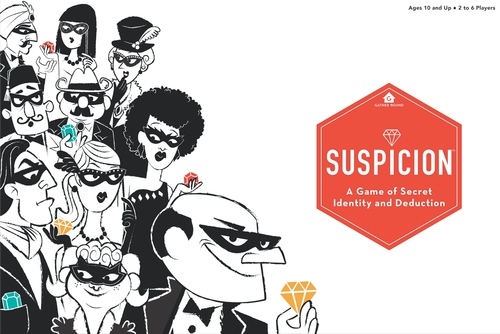 If you had to grab intro games for new players to keep in your collection I think you need Carcassonne for tile placement, 7 Wonders for card drafting, Stone Age for worker placement, and now Suspicion for deduction. I do think the retro style cover may be a detriment as currently at Target they sell retro cover Clue and Life. This may be something a new gamer sees and thinks “must be an old game too but I don’t recognize the name, must not be good”. But otherwise I really like it. Of course, please take Dale’s suggestions on high player count and only play with the most people you can. Sounds like this game is right up our alley for a family game. We really like Clue and “Clue: Museum Caper” (which is really “Scotland Yard Lite” with Clue characters), although “Alibi” really didn’t do it for us. I’m curious that Eric E. recommends “7 Wonders” as an introductory card drafting game over “Sushi Go.” I’ve had some difficulty teaching “7W” to relatively new gamers. This wasn’t bad, but I thought it could use some tweaking. Even with five players I thought it was too easy to make deductions, at least if players get to look at some unused invitations, so I would probably start with fewer gems. More seriously, if you don’t get cards that let you take gems you are at a serious disadvantage, especially if you manage to deduce everyone else’s identities, since then you have nothing to do – this didn’t happen in my game but it did in another I heard about. If I play again I would probably add a house rule stating that a player can declare the end of the game but automatically lose if they can’t properly identify everyone. What if in the room robbery action, the player chooses a gem that is not in the player’s guest room? How do you verify if the player is honest and took the right gem? I would suggest playing with people who don’t cheat.